There are lot of sites on the World Wide Web, those are helping people to make money online from the internet. These sites were spreading over different categories of net activities. Among them prominent were revenue sharing writing sites. A site called Bubblews.com emerged as the highest ranking online earning revenue sharing sites during the last few years. I had been there as a registered member. Approximately two years, I used to write small articles at this site. It was an awesome experience to write small articles of 400 characters on any subject of my interests. The site provided decent remuneration to the writers according to their scoring. Viewing the articles, commenting on them or liking them were all raised the score points and converted to money. I personally received many payments from Bubblews. At the same time, I lost many payments too, for reasons what I were not aware. My first smart phone bought out of the money Bubblews gave to me, as a memorial gift. I remember that many members were used to admire the site for their generous online earnings.No doubt that I enjoyed well to make money online using the kindness of this great site. 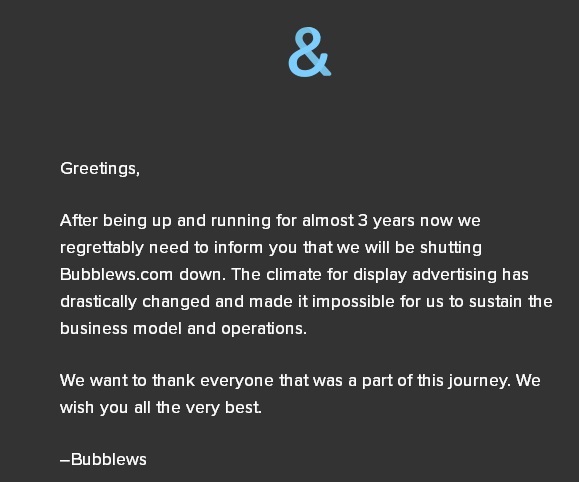 After few months of working vigorously and giving away lot of money to it's members, bubblews realized that it is not sustainable to release such vast amount of money. They introduced certain restrictions on the revenue sharing methods. The effective earning limited to few countries like United States, Canada, United Kingdom, Australia and so on. The Asian, African and Latin American type of countries were side tracked from the normal earning stream. There were amazing number of members from India, Philippines, Pakistan and many other third world countries to make money online through this site. After the imposing of the online earning restrictions, the site's ranking was reduced drastically. Naturally, the lac of visitors may directed the site to it's down fall. As a registered member of Bubblews, I was very proud about this site. But slowly the interest faded away from me. Those people from countries side tracked were disappointed too. They lost their online earning from such a good site. But any how, many people like me used to visit this site few times instead of regular and steady visiting. Recently I visited my once-favorite site and surprised to see an alert message saying that the site has ceased to operate further. I became very sad to know about the end of the "Good Samaritan" site and the only make money online site to me. Some body was murmuring inside me: Bubblews - The End of Online Earning. 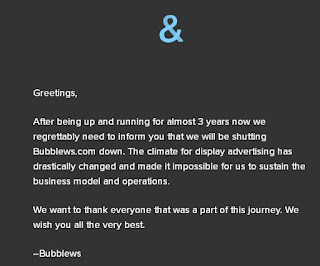 An image is showing below which shows the last message from Bubblews. good this upgrade will certainly be pushed to the various other countries. Play Store APK Download Google Play Store now has been updated to the more nice. According to the past point, regularly the coordinations of development makes a strategy unappealing to me, be that as it may I do need the salary streams I pursue to can possibly scale, and scale enormous. This implies in the event that you do find something that profits, the likelihood to develop it to an extraordinary measure of cash is a reality, and you see how this can happen. They introduced certain restrictions on the revenue sharing methods. The effective earning limited to few countries like United States, Canada, United Kingdom, Australia and so on. The Asian, African and Latin American type of countries were side tracked from the normal earning stream. There were amazing number of members from India, Philippines, Pakistan and many other third world countries to make money online through this page . After the imposing of the online earning restrictions, the site's ranking was reduced drastically. Naturally, the lac of visitors may directed the site to it's down fall.